Accuracy is one of the most important things to consider when you are choosing your paintball gun. Moreover, it is a crucial element if you want to take your game to a whole new level. However, accuracy is a complicated subject, and it can be hard to decide on the gun that provides the best accuracy and fits your style of play. Having said that, it is important that you have all the information you need before you make up your mind and invest in a paintball marker. Additionally, it is important that you understand accuracy and why it is important for you. This is the main reason why I compiled this comprehensive buying guide of the most accurate paintball guns on the market today. You can rest assured that every single unit listed below has high ratings and is only quality markers that are known to suit different skill levels. After reading this guide, you will have all the information that you need to make an informed buying decision. There is more to accuracy than finding an accurate paintball gun because the most important element is to master the art of accuracy. If you can achieve it, you will improve your game significantly. Have a look at the markers below and see if you can find a gun that matches your demands and playing style. Pricing table with an Table ID of "1accurate" is not defined. This paintball gun is one of the most popular units on the market today, and if you are serious about winning a tournament, Axe is your number one pick. The Axe is packed with awesome features, and you will be pleasantly surprised with its shooting performance where shots rattle off in smooth sequences, and you can rest assured that there will be no delays. Moreover, this marker is extremely consistent and very easy to operate, thanks to its frame design that allows the gun to fit any hand size. The sturdy, but the lightweight frame is extremely well constructed and features a comfortable grip to ensure a thorough hold during gameplay. Overall, this marker is very accurate and built from high-quality materials that make this unit one of the most efficient marker for sale today. Moreover, it is very easy to maintain and clean by using the unique push button bolt removal system. Additionally, this market features the brilliant Empire Relay Regulator that comes with an ON/OFF Lever to remove the tank. Moreover, there are plenty of different shooting modes that include Semi, PSP Ramping, NXL and Millennium Ramping. If accuracy and comfortable grip is something that you are looking for in a paintball marker, then you should seriously consider the Empire Paintball Axe marker. It is not the cheapest unit on the market, but you have to keep in mind that quality and accuracy comes with a price. If you are looking for a simple design, trendy look, and an easy-to-operate paintball marker, then the Dfender is your number one pick. It offers improved performance with all the latest technological features that you wish for in a paintball gun. On top of that, it is affordable and can easily fit any budget. Though all its features may seem overwhelming, you can rest assured that you can manage it easily without any experience at all because this unit is a fantastic choice for both the beginner and an experienced player. This marker is ultra-strong, durable, and lightweight and comes with magnesium shells. It has Z2 loader inside for the easy loading and consistent performance. Some of the key features of this marker are self-calibrating loader speed sensor, 6 AA operation for all electronics, battery change, effortless maintenance, break beam eyes in the breech to prevent ball chops, and magnesium shell for optimal strength. When it comes to performance, you can expect top-notch results. It comes with a selector switch that makes it easy to switch between different firing modes. The hopper is designed to maintain consistency with constant feed without delays. Additionally, you can take the gun apart and assemble it in just seconds, and the size is perfect for those hard-to-reach shots. Overall, this is a fantastic option for any player and comes packed with fantastic features. The Dfender is known for its accuracy, lightweight, air efficiency and comes fully equipped with single battery pack and an integrated hopper. Next up is a complete paintball gun package that contains everything you need to step-up your game. This high-quality marker is manufactured by an organization that has been ruling the paintball industry for a long time now. Therefore, their experience in intricate design and craftsmanship results in a superb product that comes loaded with amazing and advanced features like the wave trigger, riptide regulator, stinger frame and subsonic bolt engine. Another highly favored feature are the four modes of firing that include NXL, Millenium, PSP3, and semi. Therefore, you have various choices when firing and you can use them depending on the situation at hand. Additionally, it includes stealth profile RAPS ASA, industry-grade bolt engine, power button, unibody low-pressure stringer frame and redesigned low-profile clamping feed neck. There is also a high-pressure regulator that receives pressure directly from the stinger frame system. Therefore, the regulator ensures optimum efficiency and that the low-pressure operation results in high powered and accurate performance. Have in mind that this package does not include any macro line, which is both dangerous and potentially hazardous. Therefore, it does not pose any health risk to users or the environment. Overall, this unit has been receiving excellent reviews all over the Internet and players like that the marker is designed with superior durability. Additionally, despite all its great features, it is very reasonably priced. The Planet Eclipse is a good option for those looking for a reliable and durable product at an affordable price. It is manufactured using only the best material that offers excellent durability and outstanding performance. It comes with integrated LPR assembly to ensure maximum consistency. It has dual-density wrap-around grips that offer a firm grip to control the device more comfortably regardless of the playing conditions. Moreover, it offers more consistent and smoother shots than similarly priced markers and this unit fires extremely silently. Some of the key features of this marker are Zick3 rammer system, internal LPR, larger valve chambers, dual-density UniBody foregrip, inline OOPS, SL4 Inline Regulator, RGB LED interface, Infra-Red break beam sensors, rammer and valve removal, integrated rammer housing along with integrated FRM. You will find much more awesome features on this marker that are designed to improve the performance and enhance the overall playing experience. You will not find such features in any other marker within this price range. It is extremely easy to use and offers excellent accuracy. With smoother and accurate shots, you will be well on your way to take your game to a whole new level. This unit is a bit on the heavy side, but if you take into account the great benefits, this unit delivers world-class performance. All in all, this unit features a nice design, comfortable grip, improved efficiency, durability and consistent firing modes to maximize accuracy on the field. If you are looking for a tournament grade paintball gun, you should consider buying the Dye Proto Rize MaXXed. It is affordable and comes with many additional features that aid to improve accuracy during play and it will offer a wide selection of different fire rates. This unit is extremely comfortable, accurate, easy to shoot and comes packed with fantastic features. Some of the key features are the proven Hyper 3 regulator, BoreProto two pieces fourteen barrel, newly designed Patented Rize Fusion Bolt and DYE Lock-down cam leveler feedneck. On top of all these great features, you will enjoy dual density sticky grips, Dye UL Hour-glass frame, durable aluminum trigger that you can easily adjust, color coded O-rings along with a brilliant self-cleaning M2 eye pipe. It is safe to claim that the Proto Rize MaXXed marker is specifically designed to enhance your experience and offer improved performance with smoother and consistent shots. It is built with comfort and portability in mind to ensure maximum performance during gameplay. The trigger is brilliantly designed to make it easier for you to adjust your shot from different angles to reach the target more easily. Some of the benefits of this paintball marker are its design, lightweight, cost, quiet, easy-to-load, easy-to-target, and the lock system. It requires less maintenance than other units on the market, and the best thing about this unit is that it can fit any loader without the tools. Apart from that, you can also securely lock the loader with the adjustable cam-lock. 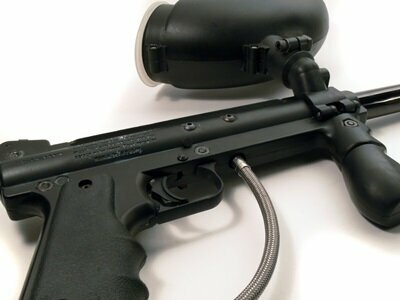 The Tippmann Switch Paintball Marker Gun 3Skull has everything that you can expect from a top-rated paintball marker. It feeds up to fifteen balls in a second without using the batteries and comes with an improved external selector switch that enables the user to switch from the safety to the firing mode more comfortably and easily. It features a large front grip that offers a proper and nice grip for improved performance. When it comes to accuracy, you can expect only the best with the stone-honed barrel. It comes with a removable front that makes it easy to add a sling. Some of the key features of this product are anti-fog lens, along with a high-quality mask with anitfog lens and visor, 3Skull 21″ orange jerk squeegee, 3Skull 6+1 Deluxe Paintball Harness Black, 20oz Co2 Tank (pin-valve), 200rd black hopper, and 6-140 round industry-grade tubes along with 1 oz of premium oil. This paintball marker was developed to deliver smooth and consistent shots with the best possible accuracy in any situation. This unit would make an excellent solution for those who are looking for a compact design that delivers top-notch accuracy during intensive plays. Overall, this Tippmann marker offers the best performance, accuracy, and requires less maintenance than other similarly priced units on the market. When you are thinking of paintball guns, you have to do some homework to ensure that the gun that you spend your hard earned money on is easy to maintain, reliable, meets your expectations and above all, is accurate. One gun that you should count on to meet the above factors is the Spyder MR100, and this marker has truly transformed the paintball marketplace. This unit is relatively cheap, despite its high-quality features. This marker comes with distinctive characters that make it the best in military style paintballs. Multiple Picatinny rails give the player endless options for customization. Moreover, it features the brilliant and simple Field-Removal functionality that was developed for easy maintenance and cleaning during gameplay. One of the key elements of the MR100 is its reliability and accuracy. It gives you 1600 rounds with its 20 oz. Standard CO2 tank. Moreover, with this gun, it is also very simple to change the velocity adjuster at the back which brings more versatility and allows you to adjust your settings according to the gameplay. 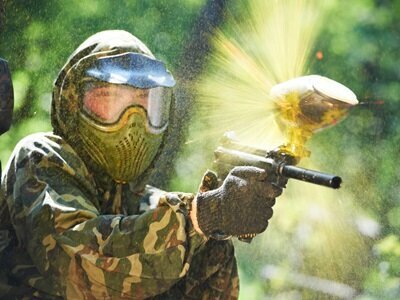 Overall, this product is great for entry level players who are seeking to explore the paintball world. It is perfect for military and woodsball simulation. Despite its awesome features, this gun is reasonably priced and delivers top-rated performance every time you play. It is lightweight and powerful, comes with a smooth shot with less recoil and is very easy to maintain. It goes without saying that every player is different, with different needs and different style. While some like to lay down and focus on accuracy with accurate shots, there are others that are in the game for the thrill of speed. Therefore, those who prefer to hit their target with every shot, they need an accurate paintball marker. Accuracy is crucial if you are playing in paintball competition because once you can hit your target in the right areas of the body, every time you shoot, you will become a highly successful player. If you want to be able to point-and-shoot with accuracy, and hit the exact part that you wanted, then you should look for the most accurate gun on the market. It goes without saying that practice holds in hand with accuracy. The more you practice, the more accurate shooter you will become. Therefore, you should invest in a gun that ranks high in accuracy to ensure that you will be able to make these hard-to-make shots because only then, you will gain that extra edge that you need to dominate other players on the field. There are two different types of markers for sale, and each type includes the different degree of accuracy. To find out which type suits you better, below is information about both types, short-range and long-range. Short-Range markers are the most common paintball types, and these markers are focused on accuracy for medium-to-short range. Therefore, these units are extremely popular among players that are playing/competing in short-medium fields, inside buildings or other closed structures. 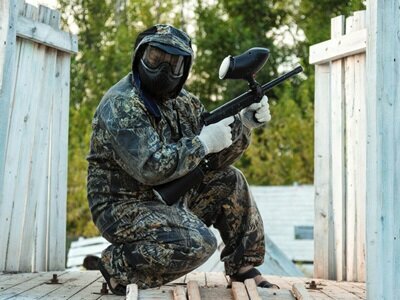 For that reason, you should invest in a short-range paintball gun if you are planning to play in such conditions. On the other hand, Long-Range markers are specialized paintball guns that are developed for long distance shooting. These types of markers also fall under the sniper paintball gun category, and you will be able to hit the target from a long distance. Have in mind that these high-end markers are more expensive than short-range paintball guns. Therefore, this is not the most popular selection among players, especially those who are on a tight budget. If you are looking for a budget-friendly marker, you could invest in a short-range gun and improve your accuracy with practice. However, that may take you significantly longer time than with a long range marker. 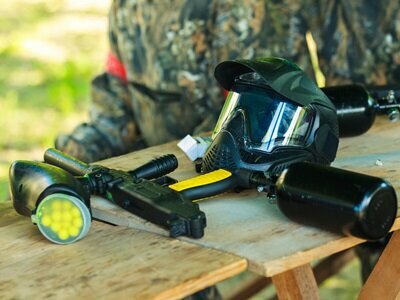 There are some things that you need to keep in mind before you fork out your money for an accurate paintball gun. For example, it is important that you understand how you will use the marker. Moreover, you need to think about grip and weight because it makes no sense to invest in a large sniper rifle if you will be playing in a small field with a lot of action. On the other hand, you should not opt for a super light unit if your plan is simply to lie down and play hide & seek. Consistency is an important element of accuracy, and you need an efficient and predictable paintball marker to match your needs. Once you have perfected the accuracy, you need to maintain it for as long as you can because, with age, your gun will lose its accuracy if it doesn’t get proper maintenance. Therefore, it is important that you clean your gun thoroughly after every play to extend its durability and accuracy. If you do not clean your gun regularly, seals and rings will get worn, and gas will leak out, making the marker less accurate and slow down your play. If you want to prevent this from happening, you should always keep your unit properly lubricated and clean your gun as often as you can. As we did mention above, lubrication and proper cleaning will also enhance the durability of your market. Don’t fall into the same pit as many other players that do not maintain their markers because that will not only slow you down and hurt your gameplay, but also your gun loses its accuracy. Therefore, always remember to clean and lubricate your gun every time you finish playing to maximize your gameplay. It goes without saying that if you want to master any sport/hobby, you need to practice. The same applies to paintball accuracy, and practice makes perfect in paintball gameplay just as in any other field in life. 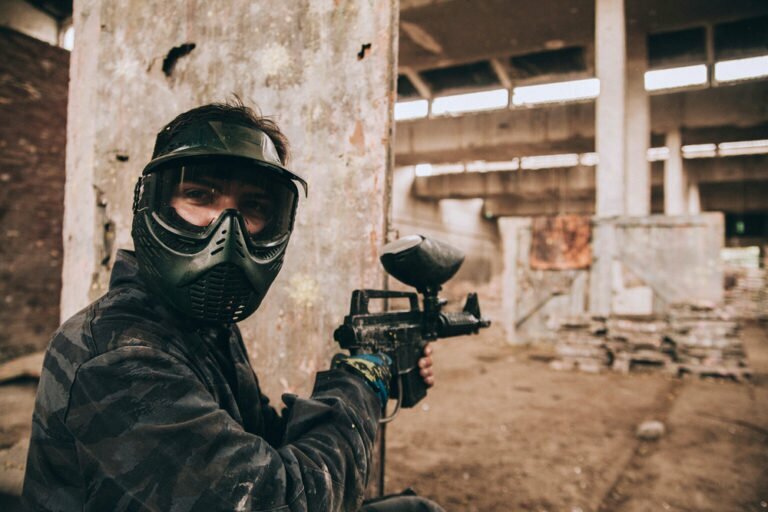 Therefore, boost your accuracy by practicing as much as you can by heading to the shooting range because there are many shooting practice ranges today that welcome paintball players to practice. Furthermore, there are even shooting ranges that have designated segments exclusively for paintball players that want to practice. If you have the chance to go to a shooting range near you, it will allow you to become better paintball sniper, and you will improve accuracy in no time at all. With practice, you will be able to hit those amazing hard-to-reach shots during gameplay and step up your game significantly. As we discussed here above, the more your practice, the better you will be able to shoot accurately. Therefore, if you compare accuracy between two players on the field, one will use a marker that he has owned for many years, and the other one will be using his brand new, upgraded marker, you would most likely put your money on the player that has mastered his gun. It all boils down to muscle memory, as it is a critical factor when comes to accuracy because the gameplay requires you to shoot at someone within a split second. Therefore, you need accuracy and hit your target before the other player hits you. For that reason, you need to master these skills if you want to maximize your accuracy on the field. This is another important element that most players do not think about when comes to accuracy. You need high-quality paint if you want to hit your target every time you shoot. Do not settle for low-end ammo and expect you to be able to hit your target immediately. Low-quality paintballs will break easily and sometimes even before they hit the target. Moreover, cheaply made paintballs will clog-up your paintball and slow you down during gameplay. Furthermore, the clogged-up gun is also harder to maintain clean, and as we did mention above, a clean paintball gun is more accurate than a dirty and clogged gun. 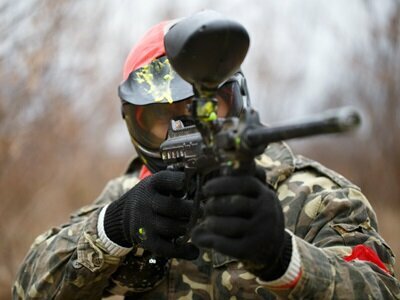 Having said that, you should only invest in top-rated paintball to ensure that you can reach your accuracy goals. Invest in few different ball brands and practice to see which one matches your demands. 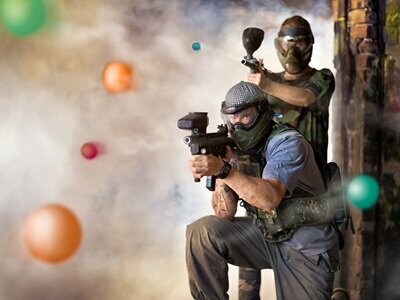 That way, you can easily find out which paintballs suit your playing style throughout the competition. Now that you know the importance of accuracy and all the factors that influence accuracy, there is no excuse but to step up your game and practice like a maniac. All the paintball units in this guide are top rated markers that are designed to maximize your accuracy. However, there is some effort needed from you to fine-tune your accuracy with practice as we discussed above. When it comes to acquiring the most accurate paintball gun to use on the field, it doesn’t matter what model or brand you choose because you will improve your skills with more playing time on the field. Maintenance is also something that you need to consider because if you clean your gun after every use, you will notice significant improvements in both accuracy and performance. Therefore, consistency and maintenance are essential elements to master if you are planning to take your game to the next level. Hopefully, by now, you will have the knowledge to invest in the most accurate paintball gun.